The 2016 update addresses the progress made in realizing the plan’s “implementation milestones,” including removing completed items and adding new projects, papers, and initiatives, among other items, to the Goals and Strategies section. 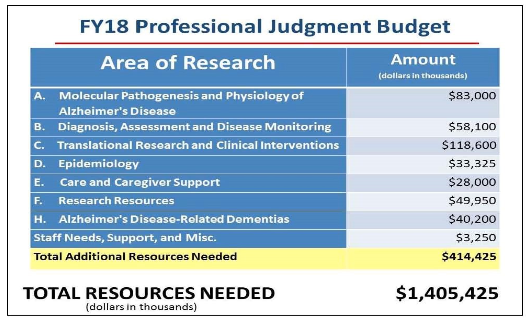 The 2011 statute also directed NIA to develop an annual professional judgment or “bypass” budget “to estimate the funds needed to fully pursue scientific opportunities to meet the research goal of the Plan—to effectively treat and prevent Alzheimer’s and related dementias by 2025.” Accordingly, the budget estimate specifically addresses biomedical research needs as well as ADRD care and services research. The bypass aspect of such a budget allows the NIA director to transmit the agency’s budget for AD research directly to President via the National Institutes of Health (NIH) director and the Secretary of Health and Human Services and then to Congress without alterations. Hodes reported that the baseline estimate for the FY 2018 professional judgement budget for AD, including ADRD, is $991,000 and will serve as the new baseline for tracking related expenditures according to the accompanying milestones. This sum is $414 million in FY 2018 above NIH’s base appropriation for Alzheimer’s and related dementias. Hodes also highlighted the NIH meetings and accompanying recommendations that provided the rationale for the priorities, milestones, and budget estimates in the FY 2018 bypass budget. According to the NIA director, 13 of the 27 NIH institutes and centers provided feedback that has been incorporated in the FY 2018 professional judgement budget. NIH will submit a bypass budget through FY 2025. NIA will provide detailed tracking of the initiatives and awards associated with the research milestones using a web-based tool. “Who develops Alzheimer’s disease, and who seems to be protected? What conditions or activities are associated with development of the disease? Investment by the agency in the development of new research tools and “groundbreaking initiatives,” such as adding a new data resource—the Harmonized Cognitive Assessment Protocol—to the Health and Retirement Study, which tracks the health, economic, and social status of older adults, is emphasized in the bypass budget. Additional funds would also be directed towards the expansion of population and health disparity investments. Developing a project to inform the design of cost-effective, community-based caregiving interventions that enable people with Alzheimer’s to remain in their homes. The NIH’s FY 2018 Bypass Budget Proposal is available here.